Popular trekking in the Himalayas of Nepal, Manaslu Circuit Trek offers with its amazing trekking trails followed by unique landscape present with opulent natural treasures and also Mt. Manaslu – the eighth highest peak of the world. 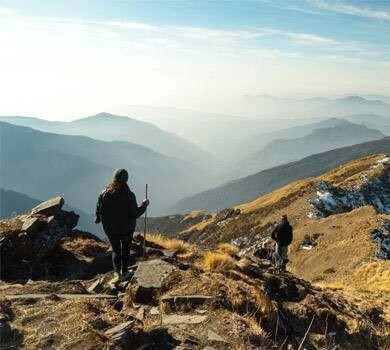 Exploring the unique taste of trekking route, Mansalu Circuit Trek delivers with its best. Manaslu (8,163m/ 26,781 ft) is one of the highest mountains in the world that is located in Gorkha district, the western part of Nepal. ….bestow with the opulent views of great Himalayas of Nepal along with the traditional lifestyle of local people and distinct flora and fauna. Officially, Manaslu region was opened for trekking in 1992. This trekking route of Manaslu region is regarded as less crowded routes of Nepal comparing to the other trekking routes. Not only this but also with the tranquil environment the panoramic views of mountains and other natural gems which are breathtaking can be observed during Manaslu Circuit Trek. Manaslu Circuit Trek is regarded as one of the favorites and adored trekking routes for the numbers of trekkers. One of the off beaten trekking routes of Nepal, Manaslu Circuit Trek is always welcoming for those who want to participate in the breathtaking and thrilling journey. The Manaslu Circuit Trek is the package where the trail leads above the Marshyangdi River, the villages which are rich in culture and traditions, and the ups-downs from hills and hillocks makes ones committed journey full of excitement. Manaslu Circuit Trek follows the incredible places that hold the opulent natural treasures along with the unique landscape. The small beautiful market – Arughat Bazaar (608m/ 1995ft) is located at nearer to Budi Gandaki River which is the attractive place and the first spot of Manaslu region trekking to hold the different ethnic groups and charming view of the nature, the places holding the cultural and traditional aspects with the enchanting natural features are like Sotikhola (700m/ 2297ft), Phillim (1570 m/ 5151ft)., Dovan (1070m/ 3511ft), Samagaun (3520m/ 11549ft) and other several small villages and the vantage points like Dharmasala (4460m/ 14633ft), Bhimthang (3590m/ 11779ft) and Goa (2515m/ 8252ft) provides with the mesmerizing views of mountains like Himlung Himal (7126m/23380ft), Cheo Himal (6820m/ 22376ft), Gyagi Kung, Kang Koru (6981m/ 22904ft) and Annapurna II (7937m/ 26041ft). Larkya La Pass (5160m/ 16930ft) is another important feature of this circuit trek that which makes the trek thrilling and exciting while crossing over this pass all the way to Bhimthang. Manaslu Circuit Trek route was recovered and made worth visiting after the earthquake in April 2015. Most of the people are still in confusion regarding the updates of Manaslu trekking trails as it was partially destroyed by the earthquake. The tea houses, trekking trails and basic facilities for trekkers are restored and back in operation. The box up package of 20 days Manaslu Circuit Trek bestow with the perfect combination of natural and cultural aspects. The trek can be customized as per one’s interest and time frame. The weather condition plays a prime role for trekking so for Manaslu Circuit Trek the perfect time are September to November (Autumn) and March to May (Spring) and also can be enrolled during January, February, and December but some weather uncertainty may arise. Manaslu Trekking Route is the restricted region trekking trails in Nepal that can’t be done without the proper guides (can’t be done by yourself). With the proper management of this circuit trek, (accommodation, food, and proper guidelines), Massif Holidays helps to make the lifetime moments with full of exhilaration and thrilling. The team of Massif Holidays will be guiding and supporting to make the journey remarkable. Scenic drive from Kathmandu to Arughat & Besisahar- Kathmandu. Stunning view of Annapurna & Manaslu Massif. Trekking routes pass through rivers, forests, old Sherpa’s villages and glaciers. Getting a close view of wild and endangered birds and animals. Outstanding view of naturally opulent Manaslu region. 19 Breakfast, 16 Lunch and 17 Dinner. Day 08: Trek to Deng (1860meters). About 6 hours. Overnight stay at Guesthouse. Day 09: Trek to Namrung (2630 meters). About 7 hours. Overnight stay at Guesthouse. Day 10: Trek to Samagaun (3520meters). About 4 hours. Overnight stay at Guesthouse. Day 11: Exploration at Samagaun. Overnight stay at Guesthouse. Day 12: Trek to Dharamsala (4460meters). About 7 hours. Overnight stay at Guesthouse. Day 13: Trek to Bhimthang (3590meters) via Larkya-la pass(5160Meters). About 7 hours. Overnight stay at Guesthouse. Day 14: Trek to Goa (2515meters). About 6 hours. Overnight stay at Guesthouse. Day 15: Trek to Chanje (1700meters). About 6 hours. Overnight stay at Guesthouse. Day 16: Trek to Ghermu (1130meters). About 5 hours. Overnight stay at Guesthouse. Day 17: Trek to Bahundanda (1310 meters). About 4 hours. Overnight stay at Guesthouse. Day 18: Trek to Besisahar (760meters). About 7 hours. Overnight stay at Guesthouse. Day 19: Drive back to Kathmandu. Overnight stay at Hotel. Day 20: Transfer to the international airport for your onward destination. All your standard Meals during the trek (Breakfasts, Lunches, and Dinners). Drive from Kathmandu –Arughat Bazaar & Besisahar -Kathmandu by public transportation. Entrance fee in all monuments during the tour in Kathmandu valley. Natural calamities, etc. that which are beyond the control can hamper one’s planned trip. During these kinds of issues, the team of Massif Holidays will be getting through the possible solution that can help to get back in trip.